Generate the Zendesk API Key. What you need to know: This integration makes use of a feature, Outbound Webhooks. To get more information about this feature please reach out to your account executive or the VictorOps support team. This guide walks you through the setup process for integrating Zendesk with VictorOps. Once complete, Zendesk will be able to automatically trigger, acknowledge, and resolve incidents in VictorOps. Additionally, acknowledgement of the incident on the VictorOps side can trigger a status change to “pending” (or whatever status you desire) in Zendesk. From the main timeline select Settings >> Alert Behavior >> Integrations >> Zendesk. Copy this endpoint URL to your clipboard. You will need it when configuring Zendesk. 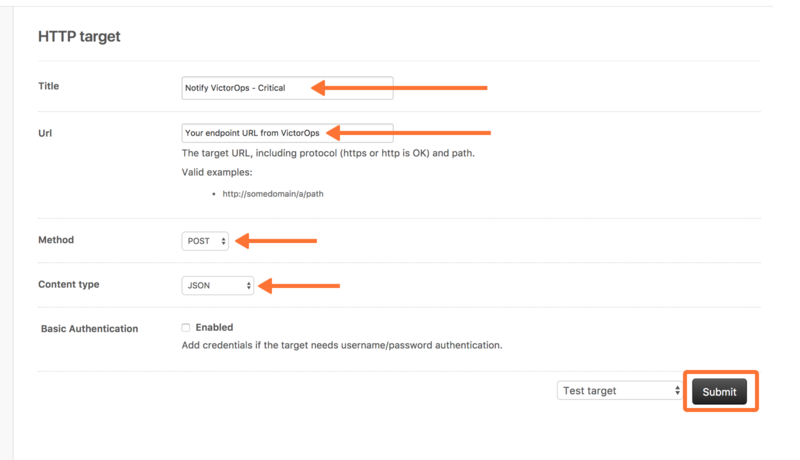 Routing keys in VictorOps can be set up and associated by clicking on Settings >> Alert Behavior >> Route Keys. For more information on routing keys and best practices, click HERE. From your Zendesk portal select the Settings Gear on the left side-menu. Under the Settings section, select Extensions. In the resulting menu, click on add a target. Select the HTTP Target option. Configure the HTTP target with an intuitive name. Paste in the endpoint URL you copied from VictorOps (Be sure to change the routing_key value to a valid routing key as noted above). Select a Method of POST and Content type of JSON. Leave the Basic Authentication box unchecked and the Test target option selected and click Submit. Copy and paste in the following JSON body, and click Submit. If configured correctly, you should see a 200 success response similar to this. Check your VictorOps timeline for a new event. 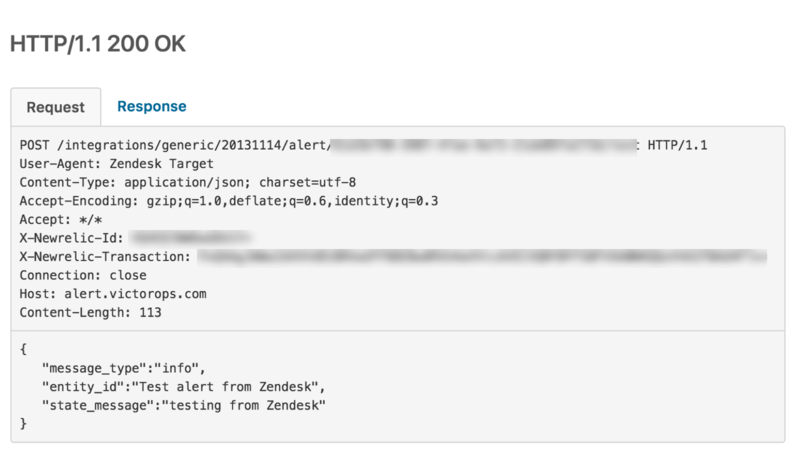 This is an INFO message which will not create a new incident in VictorOps, but is intended only to confirm that Zendesk can successfully send events to VictorOps. Finally, click the x to exit the success message. Change the option to Create target and click Submit. In the left side-menu, locate the section for Business Rules and select Triggers. From the Triggers menu select Add trigger. Note: You may alter these to further filter which conditions will alert VictorOps or to fit your specific work-flow if you do not wish to create a VictorOps incident for every new case. Under the Actions section, click Add Action. In the first dropdown (left), scroll down to the Notifications sections and select Notify target. In the second dropdown (right), select the VictorOps target you created earlier. 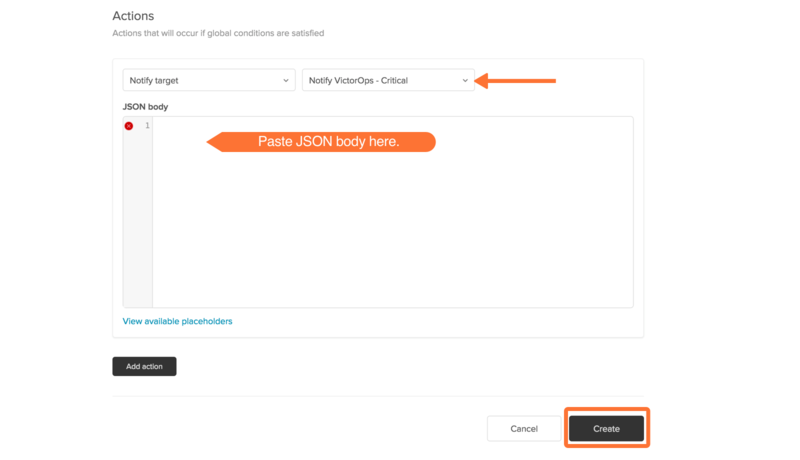 Copy the JSON payload below and paste it into the JSON body box, then click Create. This trigger will open a new incident in VictorOps. You will now need to replicate this process to create two more triggers that will send alerts to VictorOps for acknowledgement and recovery events when cases are assigned or closed in Zendesk. You will reuse the same target created earlier for each new trigger. Again, you can change the trigger conditions to fit your specific needs. This trigger will send acknowledgement alerts to VictorOps, to ack the incident and stop paging and escalation. 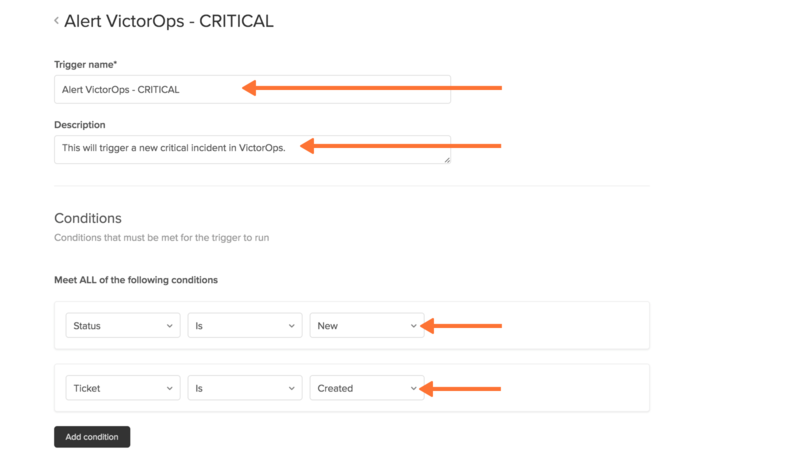 This trigger will send recovery notifications to VictorOps to close out the incident. 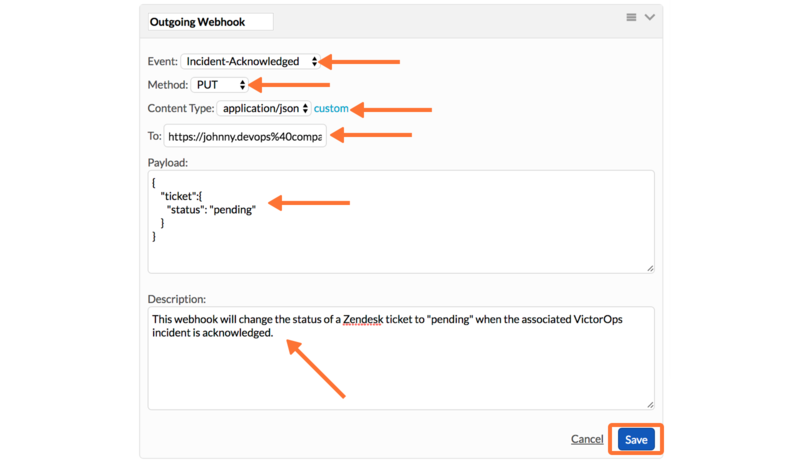 Using our Custom Outgoing Webhooks feature, it is possible to have the acknowledgement of a Zendesk incident in VictorOps automatically transition the related Zendesk case to a status of pending (or whatever status you prefer). First you will need to build the appropriate destination URL for your Zendesk account like so. Note that certain parts of the URL must be URL encoded in order to function properly, so make sure you follow this structure exactly. The “@” symbol just before the sub-domain is NOT encoded. In the left side-menu, locate the Channels section and click on API. In the Zendesk API menu, on the Settings tab, make sure that Token Access is enabled and then click the “+” button to generate a new key. Give the key a name. Click the Copy button to copy the key you your clipboard, and click Save. In the Outgoing Webhooks menu, click Add Webhook. For the Event dropdown, choose Incident-Acknowledged. For the Method, choose PUT. For the Content Type, choose application/json. In the To: box, paste the complete destination URL described above. Finally, give the webhook a brief description and click Save. If you have any questions please contact VictorOps support.